"Even my boyfriend, who is a meat and potatoes kind of guy, gets excited when I make this dish. As an added bonus, this happens to be fit for a vegan. This pleases a broad range of diets and tastes. Peeling the squash is quite tricky, but I have found that a carrot peeler is the most useful tool for this job. Serve with pita bread." In a large heavy-bottomed pot, heat olive oil and saute the onion for a few minutes. Add the cinnamon and chili powder and continue to saute for another 2 minutes. Mix in the garlic and cumin seeds, saute for 2 minutes more before adding lemon juice and the tomatoes. Mix thoroughly so the stew doesn't get too chunky. 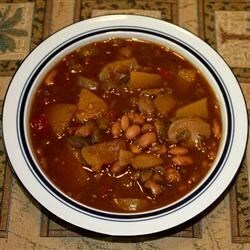 Stir the squash, pinto beans and water into the stew. Season with salt and pepper to taste. Let the stew simmer for 1 hour, or until squash is tender. Stirring occasionally throughout the cooking hour, and add more water if necessary. The finished stew should have a nice, thick stewy texture. Heat a large skillet over a medium-high heat. Place one piece of pita bread at a time into the skillet. When one side of the pita bread gets hot, flip the bread over and heat the other side; approximately 1 minute of cooking per side. Serve the stew with the heated pita bread. This simple summer stew stars squash and smoky andouille sausage. Very good, but next time I think I'd use a little less chili powder. Interesting combination of spices... hearty but i just couldn't eat much of it because it was too hot- 2 tablespoons of chili powder! I would use less next time. This stew took 3+ hours to make, and was so spicy that it was not palettable. We just couldn't eat it. I think you meant teaspoon of pepper not Tablespoon. I thought this was good but my "guys" didn't care for it at all. Very good! Just make sure to go light on the chili powder and add more to taste. I roasted the squash at 375 for 20-25 min before adding to the stew.